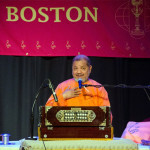 Swami Tejomayananda Completes Week-Long Visit to Boston, Celebrates Jnana Yagna at Chinmaya Maruti. ANDOVER, MA—Spiritual leader and world-wide Chinmaya Mission head Swami Tejomayananda completed his week-long visit to Chinmaya Maruti and led Jnana Yagna and discourses on Bhagavad Gita for Daily Living and on Guru, the Guiding Light and Roles and Goals, spreading the wisdom of Vedanta throughout the world. With his busy itinerary that included San Jose, Portland, Minneapolis, Pittsburgh, Dallas, London, and so on, Chinmaya Mission Boston (CMB) was fortunate enough to be part of that itinerary, hosting him from July 21st through 26th, 2016. This visit was extra special as it was the last Jnana Yagna conducted by Pujya Guruji in Boston before he steps down as the world-wide head of Chinmaya Mission at the end of this year. 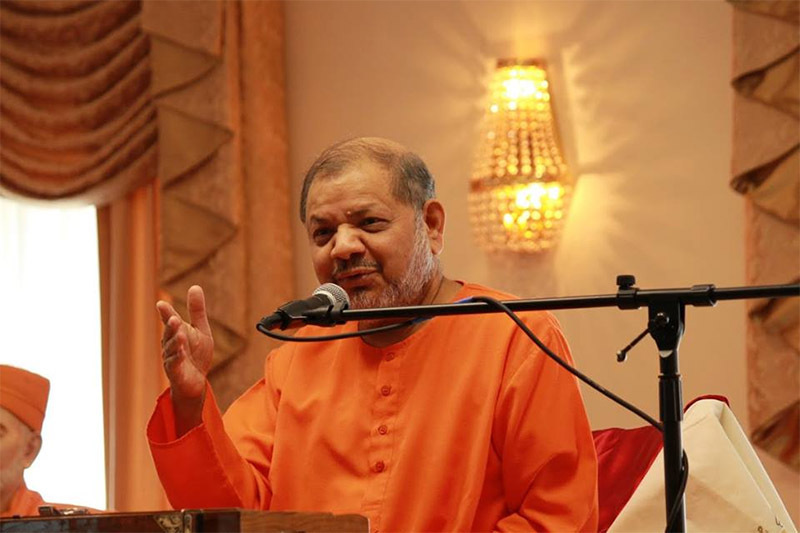 For six days, in his discourses on Bhagavad Gita for Daily Living, Pujya Guruji lovingly shared with us not just what the Gita teaches us for our day-to-day living, but more importantly the why’s and the how’s as well. By pointing us to verses from the Gita, Guruji clearly explained how best to maintain our relationships with material things and interactions with humans, as well as why doing so would lead to a happy life. At the Metrowest center of Chinmaya Mission Boston, Pujya Guruji gave a brilliant talk about our Roles & Goals. He started off by describing the seemingly varied roles each of us plays in our daily lives and the different goals that go along with them. By the end of the discourse Guruji had shown us how ultimately all of us have only one role and one goal – we should see the Lord in everyone (Sevak); and all our actions should be done with the attitude of worship of the Lord (Seva). In his discourse on Guru, the Guiding Light, Guruji explained how a spiritual teacher would help us understand what is Real and Unreal in this world; how that understanding would lead us from the darkness of ignorance to the light of knowledge; and how that knowledge would free us from the fear of death. We were also fortunate to listen to discourses on Gopika Geetam from Srimad Bhagavatam by Swami Shantanandaji, head of Chinmaya Mission West. Just listening to the beautiful meaning behind Lord Krishna’s tricks and the devotion the Gopis had for their Lord tugged at our heartstrings. With great pride and joy, CMB members felicitated Pujya Guruji Swami Tejomayanandaji on Saturday, July 23rd for having received the Padma Bhushan, one of India’s highest civilian awards earlier this year. At the same time, Pujya Guruji released the “Chinmaya Maruti” souvenir that was brought out on the occasion of Pujya Gurudev Swami Chinmayanandaji’s birth centenary and Pujya Guruji’s visit. All six days of spiritual discourses saw packed halls. CMB members, local non-Mission members and Chinmaya Mission members from Ottawa to Florida were in attendance. Cultural programs by CMB members preceded the evening lectures and set the tone for the evening. With Pujya Gurudev’s grace and blessings the Jnana Yagna went off smoothly and all CMB members are ever grateful to Pujya Guruji for giving us this opportunity. 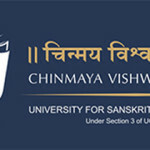 Chinmaya Vishwavidyapeeth (Chinmaya University) has received an in-principle approval on June 8, 2016 from Ministry of Human Resource Development, Government of India, for establishing the deemed university for Sanskrit and Indic Traditions. Due to a change in the regulations for establishment of deemed universities that occurred subsequently, we are now in the process of establishing 5 departments in our main campus at Chinmaya Eswar Gurukula, Veliyanad, Kochi. These departments, encompassing a bridge between Ancient Indian knowledge traditions and their application in current day knowledge fields, will be established in the next few months and the University plans to commence its degree granting academic programmes from academic year 2017-18. In this year 2016-17, the University will begin a few Certificate Programmes in its twin campuses at Chinmaya Eswar Gurukula, Kochi and Chinmaya Naada Bindu Gurukula. August 24, 1997 Sandeepany at Kolhapur Maharashtra inaugurated. Sandeepany Andhra Pradesh organises Brahmasadas, a State-level conference much like a refresher course on the Upanishads. Gurudev’s Commentry translated in French language. Gurdev’s Mortal Brought to Delhi. Bangalore-On the occasion of the 70th birthday of Swami Chinmayananda Swamiji was weighed against silver. April 14, 1985-Sandeepany Prayag inaugurated. 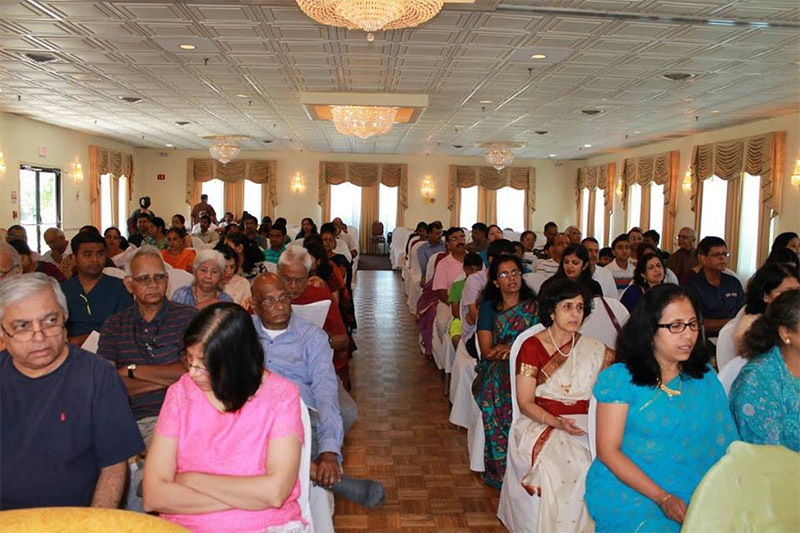 ‘Chant Gita Land Washington’ all-India Gita Chanting competition was organised. Kumari Iyer of Nagpur won the first prize. April 25 & 26, 1981-Sandeepany Himalayas, the second Vedanta institute is inaugurated. 1979-Chinmaya Mission West (CMW) founded in Piercy, California. November 7, 1979-Sandeepany West, the second Vedanta institute inaugurated at Piercy. Chinmaya Gram, a 35 acre housing complex for members of the Mission inaugurated at Virugambakkam, Chennai. March 1966 Kuala Lumpur, Malaysia-First jnana-yagna conducted by Swamiji beyond the shores of India. Introduction of the Chinmaya Lesson Course to overseas students. (Currently popular as the Foundation and E-Vedanta course offered by Chinmaya International Foundation). ‘Tyagi’ being published from Chittoor merged with Tapovan Prasad which became ‘one voice’ of the Mission thereafter. Four month global tour covering thirty-nine cities worldwide was initiated. 30,000 devotees attended a public meeting at Oval Maidan, Mumbai to bid Swami Chinmayananda a fond farewell drawing a parallel to the farewell given to Swami Vivekananda at Chennai seventy-two years earlier. May, 1965 Chinmaya Pradeep, first Hindi monthly of Chinmaya Mission published from Mumbai. July, 1965 Swami Chinmayananda returns after the global tour also known as Meruvidhi a unique pilgrimage undertaken by Mahatmas. August, 1964, Inaugural meeting of the Vishva Hindu Parishad (VHP) aimed at consolidating the Hindutva movement, held at Sandeepany Sadhanalaya. Swami Chinmayananda headed the committee which drew up the Memorandum of VHP. Swami Chinmayananda’s deeksha Guru, Swami Sivananda Maharaj attains Mahasamadhi and Swami Chinmayananda takes up austerities for a year. February 1962, Chennai – The hundredth yajna completed – within a decade! Commentary, with each shloka’s meaning and its purport on the entire Bhagavad Gita completed. This Gita named ‘ the Holy Gita’, then went on to become a widely acclaimed and accepted practical commentary on the Gita. September, 1958 – A second publication, a monthly called Usha aimed at coordinating, monitoring activities of the Mission & ethical governance of Yajna-committee, came out from Hyderabad. 25 Yajnas conducted in: Kolkata, Pune, Rewa, Delhi, Chennai, Madurai, Coimbatore, Palakkad, Bangalore, Kozhikode, etc. Swami Chinmayananda ponders how best to impart the knowledge gained to the people on the banks of River Ganga and inspired by Mother Ganga, decides to come down to the plains and impart the knowledge of Vedanta to the seekers across the country. 8-May 1951 – Beginning of a reconnoitering tour of the plains as suggested by Swami Tapovan Maharaj. Swami Chinmayananda’s first visit to the great Mahatma Swami Tapovan Maharaj on Swami Sivananda’s suggestion. Swami Tapovan Maharaj accepts him as student on conditions of strict austerities. February 25, 1949 – Balakrishna Menon given sannyaas by Swami Sivananda and now called Swami Chinmayananda.